What this life might seem for those Arab Christians in Iraq these days must be a gloomy, realistic and desperate thought. While they know of their brothers and sisters in the West, of their military power and financial strength they do not feel even the slightest touch of aid to try and solve their desperate situation. 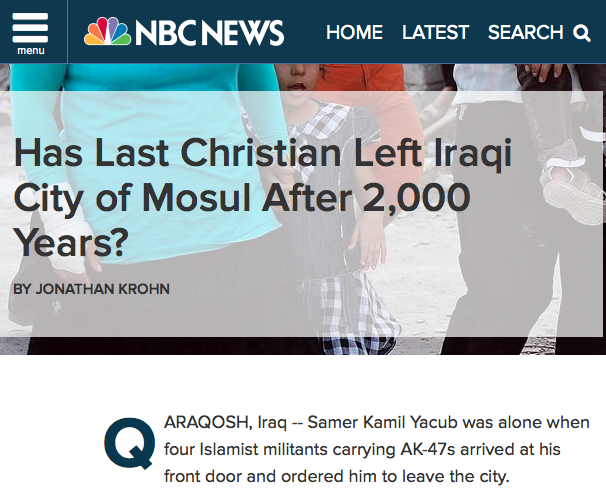 As ISIS rolls in, Christians are faced with a choice that they did not confront for about 1,400 years. Convert, pay or Die. The ISIS fighters are firm believers in the Islamic old ways, and they stay true to that, non Muslims are offered – just as they did hundreds of years ago, the option between paying the Jizya, converting to Islam or death by the sword. In many terms these Christians would have been much better defended 800 years ago, when sympathy and help would arrive from Christian nations in Europe, but now their tears produce no more than 5 minute on French TV news. The latest information is that France has offered some of the Christians refuge, maybe in hope to pathetically balance the figures of religious immigration to the country, however French Arabs – or simply Arabs in France, who are fanatics to human rights when it comes to anything that has to do with Israeli issues, do not take to the streets for their fellow Christian Arabs, or even for the Shiite community in Iraq which is fighting for its life. What a strange world this is, that an Atheist blog laments the end of Christian presence in Iraq you realize how hypocrisy and bigotry rule the Western Governments.